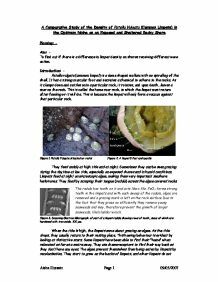 A Comparative Study of the Density of Patella Vulgata (Common Limpets) in the Optimum Niche on an Exposed and Sheltered Rocky Shore. A Comparative Study of the Density of Patella Vulgata (Common Limpets) in the Optimum Niche on an Exposed and Sheltered Rocky Shore Planning: - Aim: - To find out if there is a difference in limpet density on shores receiving different wave action. Introduction: - Patella vulgata (common limpet) is a dome shaped mollusc with no spiralling of the shell. It has a strong muscular foot and secretes a chemical to adhere to the rocks. As it clamps down and settles onto a particular rock, it rotates, and upon death, leaves a scar on the rock. This is called the home scar rock, to which the limpet must return after feeding or it will die. This is because the limpet will only form a vacuum against that particular rock. Figure 1. Patella Vulgata situated on rocks Figure 2. A limpet's foot and mantle They feed mainly at high tide and at night. Sometimes they can be seen grazing during the daytime at low tide, especially on exposed shores and in humid conditions. Limpets feed at night on microscopic algae, making them very important seashore herbivores. They feed by scraping their tongue (radula) across the algae covered rocks. Figure 3. Scanning Electron Micrograph of part of a limpet radula showing rows of teeth, some of which are hardened with iron oxide. 100 �m. When the tide is high, the limpets move about grazing on algae. As the tide drops, they usually return to their resting place. This homing behaviour is evident by looking at distinctive scars. Some limpets have been able to find their "home" when relocated as far as a metre away. They use chemoreceptors to find their way back as they don't have any eyes. The algae prevent themselves from being eaten by limpets by recolonisation. They start to grow on the backs of limpets, and other limpets do not feed off the back of limpets. ...read more. I couldn't keep the measuring tape 4m all the way along the shore above the tide because the rocks were jagged and rocky so I tried to keep it as constant as possible. The quadrat also didn't lie flat due to the uneven surfaces, so I tried to count the number of limpets as accurately as possible by envisioning the location of the quadrat had the surface been flat. I used the same measuring tape on both shores as the width of the measuring tape could cover a limpet and therefore affect the limpet density on each shore, but if the same measuring tape is used on both shores, as the same error is present throughout the experimental approach, it is fixed error and is cancelled out. All measuring devices and methods contain fixed error, as well as human error. Using coordinates generated from a calculator on both shores ensures the same area is studied on both shores, so a precise comparison is carried out. Apparatus: - * 25cm2 quadrat because this is the best size relative to the organism's size. * Tape measure to lay out at 4m above sea level to take random samples along it. * Optical level to accurately measure 4m above chart datum. * Meter rule to place the optical level on. * Exposed rocky shore - Castle Beach. Grid reference: SM819050 Location: Follow the coast path Nearest Telephone: Dale Fort Nearest Vehicle Access point: Through vehicle gate by point house Escape Route: Coast Path * Sheltered Rocky Shore - Frenchman's Steps. Grid reference: SM819052 Location: Through the field of Point house and down the steps. Nearest Telephone: Dale fort Field centre Nearest Vehicle access point: Road at the bottom of Point House. Escape Route: At low tide, along the beach to the dale fort Jetty beach. * Animal key to ensure I correctly identify the common limpet, not any other type, or even a different species. ...read more. The optical level has a certain amount of fixed error in it, which cancels itself out as it was present on both shores. The measuring tape also didn't lie flat at 4m, so I wasn't taking samples always exactly in the optimum niche which may explain why some limpet numbers were low. People walking and stepping on limpets may have caused a few of them to fall off, resulting in lower limpet numbers. I may have misidentified the limpet which is highly unlikely, but still a factor to be considered. I used chart datum to determine the optimum niche, however, this may not be entirely accurate and a reliable source of information. Limitations of the procedure were the number of samples, duration of the project, and no repetition of readings. The number of samples was too low to estimate the total size of limpet population in the optimum niche. The project only lasted half a day, at only one time of the year, so it did not allow for seasonal changes such as mating, fertilisation, predation etc. I also only looked at one type of exposed rocky shore and one type of sheltered rocky shore, which limits our evidence of higher amounts of limpets on exposed rocky shores than sheltered rocky shores. There weren't many anomalies, apart from on the exposed rocky shore, the numbers of limpets got a bit low. This could have been due to the fact the tape measure wasn't lying exactly 4m above sea level, so the samples weren't always taken on the optimum niche. Some samples may have been removed from the rocks due to people walking on the limpets and accidentally knocking them off. There may also have been to much intraspecific competition for biota, thus forcing the limpets to repopulate elsewhere. I think the anomalies did have a serious effect on the conclusion of the statistics, as the calculated result (20) was a lot lower than the critical value (127). This proves the experimental procedure was fairly inaccurate and to improve it the sources of error must be tackled. ...read more. It is also high in protein which is needed for recovery and muscle development. This is ideal at the start of the day before training because it will provide plenty of energy to train well, and protein to help make it more effective. The reason I am using the pooled results and not my individual ones is because altogether there are 30 replicates for each concentration in the pooled results where as in my individual one there is only three. The greater the number of replicates means the more reliable and accuracy the results are likely to be. Investigation on the size of Limpets. These chemicals are then utilised in the next stage, known also as the Calvin Cycle, to form carbohydrates. Energy is thus stored within the bonds of the resulting molecules such as glucose. On absorption of these molecules, primary consumers that feed on these algae, such as limpets, harness this stored energy through respiration. Many questions will arise during the course of my investigation. It is therefore my duty to assign as many as I can. I may not be able to respond to each one due to the time factor. I may decide to include more factors to my investigation, and therefore apply them to my investigation, regarding I have the time. The limpets would move over the rock taking the algae when the tide comes over. If not, the chance of water loss would be too great and they would dry up. Therefore, limpets must make their home scar in an area that will be covered by the tide for long enough to feed. * By no means should I or any other unaware person consume the apple juice produced; therefore the apple juice produced should be disposed off as soon as the experiment is over. * I need to use the knife with care, in order to prevent myself from getting cut. Fair Test: The only variable I am changing is the concentration of bile salt solution. Variable How will it be controlled Why must it be controlled Independent Variable: Concentration of bile salt solution This is the only variable I will be changing. Central Controlling Area The respiratory centre located in the lower part of the brain stem, in the medulla oblongata in the area responsible for controlling breathing. This region has both "inspiratory neurones" and "expiratory neurones? which are active at different times of breathing.